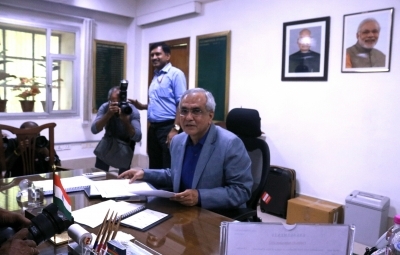 The NITI Aayog on Wednesday constituted an Expert Task Force led by its Vice Chairman Rajiv Kumar to boost employment in the country through increased exports. The task force would propose an action plan to create well-paid, formal sector jobs and alleviate underemployment in both goods and services sectors, the planning body said in a statement. “Given the importance of exports in generating jobs, India needs to create an environment in which globally competitive exporters can emerge and flourish,” the National Institution for Transforming India said. It said the task force would also address the issue of low wages by boosting India’s exports in key labour-intensive industries. The other responsibilities of the task force include recommending sector-specific policy interventions, identifying key macroeconomic factors constraining exports and suggesting methods to address these constraints, and assessing the effectiveness of existing schemes to promote exports. The task force would also address issues related to logistics, export credits and trade facilitation, recommend measures to enhance trade in services with high employment potential, and suggest ways to enhance the availability of reliable, timely and globally comparable data on trade, the NITI Aayog said. “While the Indian workforce has high aspirations, a majority of the workers are still employed in low-productivity, low-wage jobs in small, micro and own-account enterprises. “An urgent and sustained expansion of the organised sector is essential to address India’s unemployment and under-employment issue,” it said. The NITI Aayog also recommended a shift towards more labour-intensive goods and services which are destined for exports.